It was our last home game for the 2004/05 season which had originally been scheduled for 16th April but because of our FA Cup semi-final game at the millennium stadium had to be moved, we had also made it to the FA Cup final. It was an evening midweek game and it had a strange feeling to it, I suppose it was because of the rumours that this might be Dennis (God) Bergkamp’s last home game as an Arsenal player because he was due to retire that year after ten great years, it was also Edu’s last home game as he had confirmed that he would be leaving Arsenal. In the first few minuets Everton has a few shots on goal and it looked like it might be a tight hard fought game but from the time the first goal went in on eight minuets you sensed it was going to turn into a great game, the one and two touch passing was a joy to watch. The first goal where Bergkamp pick up the ball from the left side of midfield ran with the ball towards the eighteen yard line and threaded a quality pass through to Robin van Persie, everyone started singing “There’s only one Dennis Bergkamp” Every move, every pass was slick and precise Robin Van Persie was up front with Dennis Bergkamp. 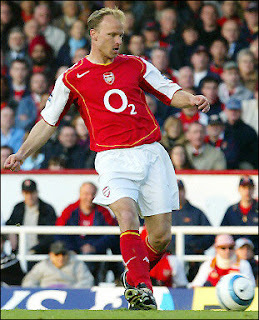 It became the Dennis Bergkamp show, so much of the moves he was at the heart of. The second goal again involving God, again from just inside his own half he put on a beautifully weighted pass to Reyes on the left hand side of the eighteen yard box who in turn crossed the ball which Robin fails to get on the end of, it goes through to Robert Pires on the edge of the box, he has a shot at goal which gets parried out by Richard Wright and Pores heads the back and into the net, two nil. The third goal again involves God, picks the ball up off Van Persie and lays the ball off to Patrick Vieira in the box who finished with a lovely little chip, three nil. Yet again “There’s only one Dennis Bergkamp” and “We’ve got Dennis Bergkamp” and “One more year” is sung. The second half started as we finished the first half, it was a great atmosphere and the team were passing Everton off the park; we could all sit there and enjoy the beautiful game as it’s meant to be played. Henry came on for Van Persie at half time. Goals four and five went in all with the great one, two touch passing we had enjoyed in the first half and the whole season in fact. We won a pen on 70 minutes the whole ground wanted Dennis Bergkamp to take it as we thought it might not be offered a contract to stay at Arsenal for at least another year but as we know he had not taken a penalty since you know what match in 1999. Edu took the penalty and scored; the crowd erupted with joy and with a tinge of sadness as it was going to defiantly be Edu’s last home game. Dennis Bergkamp scored the sixth goal on 77 minuets and was definitely deserved as he was involved in almost every goal, Highbury again broke out in song with “Walking in a Bergkamp Wonderland” and then “one more year, one more year, one more year” we wanted to put as much pressure on Arsene and the board as possible to extend his contract we was not ready to say good by the Dutch Master yet. The game ended 7-0 and everyone went home happy, we might not have won the league that year but we had secured champions league football by finishing second place and had a FA Cup final to look forward to, happy days!!!! A small footnote, Arteta was playing for Everton in that game; he was signed on loan from Real Sociedad in January that year. Arsenal: Lehmann, Lauren, Campbell, Senderos, Cole, Pires (Fabregas 64), Vieira (Flamini 45), Edu, Reyes, Bergkamp, Van Persie (Henry 45). Subs Not Used: Almunia, Toure. Booked: Flamini, Campbell. Goals: Van Persie 8, Pires 12, Vieira 37, Pires 50, Edu 70 pen, Bergkamp 77, Flamini 85. Everton: Wright, Hibbert, Weir, Yobo, Pistone, Carsley, McFadden, Watson, Arteta (Ferguson 75), Kilbane, Beattie (Bent 45). Subs Not Used: Stubbs, Plessis, Turner.